Courtroom illustrator, Bill Robles will talk at the Santa Clarita Artists Association meeting Monday, May 20. This event is free, open to the public and meets at 6:30 p.m. at Barnes & Noble, 23630 Valencia Blvd. 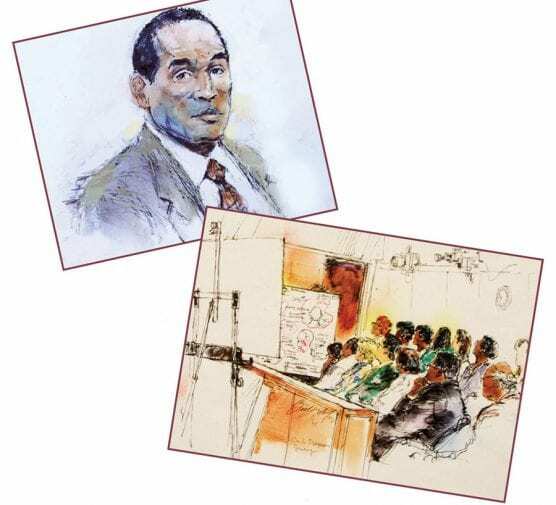 “I love courtroom illustrating…the immediacy…working feverishly…the adrenaline flows…and suddenly it is over, onto the satellite and seen around the world,” said Robles. Patricia Hearst; Actor Lee Marvin’s Palimony Trial; John De Lorean, The Night Stalker– Richard Ramirez; Rodney King; O.J. Simpson; the Unabomber; Oklahoma City Bombers Timothy McVeigh and Terry Nichols; the Menendez Brothers; Robert Blake; Michael Jackson; Paris Hilton; Lindsay Lohan; Arizona shooter Jarad Lee Loughner; Aurora Theater shooter James Holmes; Dodger Stadium Beating Victim Bryan Stow Trial; Donald Sterling vs. Shelly Sterling LA Clippers Ownership Trial; Enrique Marquez (purchased weapons for San Bernardino Terrorists); Led Zeppelin Copyright Trial; Los Angeles Sheriff Lee Baca Trial; and Robert Durst. • Selected by NASA to be on site and document the first four Space Shuttle missions. • Nominated for an Emmy. • Gold Medal Award from the Los Angeles Art Directors Club for his coverage of the Manson trial. • Three Gold Medals from the Broadcast Designers Association. • Awards from the New York and Los Angeles Society of Illustrators. • Lifetime Achievement Award from the Los Angeles Society of Illustrators. • In 2016, the Library Of Congress acquired all of Bill’s original artwork from the book publication titled “The Illustrated Courtroom 50 Years of Courtroom Art”. New York gallery owner Margo Feiden said, “People won’t say I have a drawing of the O.J. Simpson trial; they’ll say I have a Bill Robles.” Robles’ clients include: CBS NEWS, CNN, NBC NEWS, FOX NEWS, the Associated Press, Reuters, and various entertainment venues. He received his Bachelor of Arts Degree from Art Center College of Design. Several years later, he returned to Art Center as a Drawing instructor and continued his teaching career for more than twenty years in the Visual Communications program at Los Angeles Trade-Technical College. Robles currently lectures about his courtroom artwork at libraries, colleges and art groups. See http://www.billrobles.com. Come early, standing room only by 6:30 p.m.
For more info on the artclub, see: www.SantaClaritaArtists.org.